Wow, Hendrix, the man himself! This is an interesting statement that he presents here. It came at a time when musicians were literally trying to change the world through the power of their music. The musicians were the activists, leading a revolution of consciousness and freedom. Unfortunately, however, it did not completely work. Did we prove some things to the world with the Be-Ins and Woodstock? Yes, of course we did. But in the end, our government is still as corrupt as it was 50 years ago, and the way of the world is still based on laws that can’t be changed because of that corruption. Therefore, I do not completely agree with the second part of Hendrix’s quote. Do I believe that music is powerful? Yes. Do I believe that music has the ability to change the world? Yes. But I do not believe it is the only way to change the world. I have always believed that it is the littlest things that change the world. Holding the door open for someone and seeing the smile that tells you you just made their day; a single mother working overtime but never losing sight of her children as the most important things in her life; a person standing up for what they believe is right, no matter what anyone else says, without resorting to violence. I do, however, agree with Hendrix’s first statement. “Music doesn’t lie.” You can’t hide your feelings in music. You can find creative ways to express them, but your true meaning in the song always comes across to listeners. Whether or not they always interpret the songs in that way is another story. 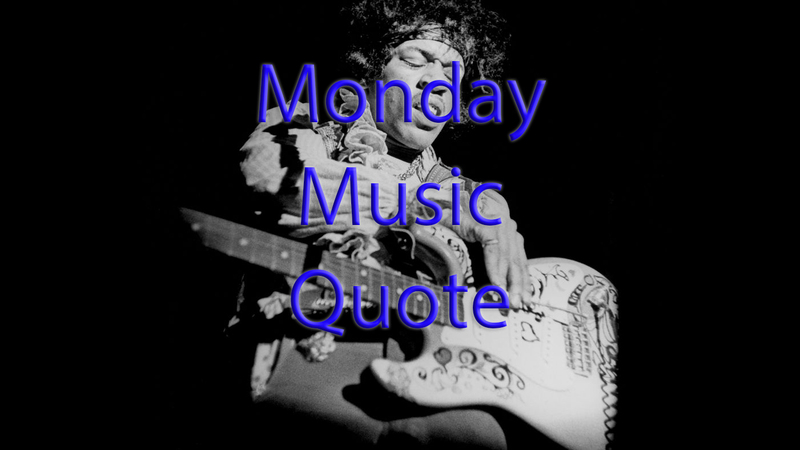 This entry was posted in Monday Music Quotes and tagged Hendrix, Jimi, Jimi Hendrix, Monday, Monday Music Quote, Music, Quote.